Part of the responsibility of landscape design is to assure successful longevity of the construction, taking into consideration all-season drainage, temperature fluctuations, erosion, tree root systems and other disruptive influences. Our fleet of heavy-duty machinery operated by experienced, skilled professionals ensures proper planning and implementation. Often, as clients describe their hopes for their ideal landscape design, they realize that they have neglected to consider the need for a place to store their equipment or they desire to improve or remove an existing structure on their property. Sometimes an idea is born as the plan unfolds or a whim becomes a quest for the ultimate luxury. 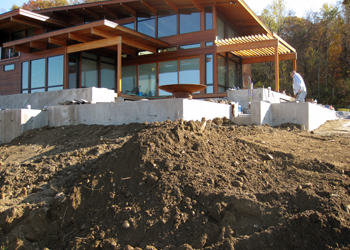 After all, the scope of a landscape project can frequently be a once in a lifetime opportunity to realize one’s dreams!